HONG KONG (Reuters) - Li Ka-shing's rise from penniless immigrant in 1940 to billionaire tycoon is the consummate success story in Hong Kong, a city which progressed alongside him from trading outpost to one of the world's biggest financial centers. A factory apprentice when he was 13, Li, who announced his retirement on Friday at 89, was called "Superman" in the ultra-capitalist hub for his work ethic and business success. Li has used his business acumen, as well as a habit of personally investing alongside his companies, to amass a fortune estimated by Forbes at $35.3 billion, making him the world's 23rd richest man. "I've been working for a long time, too long," a relaxed and sprightly Li said on Friday after announcing he would step down on May 10. While Hong Kong's adoration of the billionaire and his rags-to-riches story has waned somewhat in recent years, he is still stepping aside from one of Asia's most outward-looking empires, spanning more than 50 countries and 323,000 employees at last count. Through a career spanning the 78 years since his family fled war-torn China for Hong Kong, Li built fortunes first in plastics and property before joining the first wave of top-tier Chinese tycoons in the city with the 1979 purchase of Hutchison Whampoa, a venerable British "hong" or trading house. Along the way, he led raids on rivals, built strong - later controversial - ties with mainland leaders, was rapped on the knuckles for insider dealing in Hong Kong and turned his sights to overseas expansion in a way that few of his local rivals ever did. Also unlike his rivals, including fellow hongs Swire Pacific <0019.HK> and Jardine Matheson (JARD.SI), he proved adept at something else: selling assets. 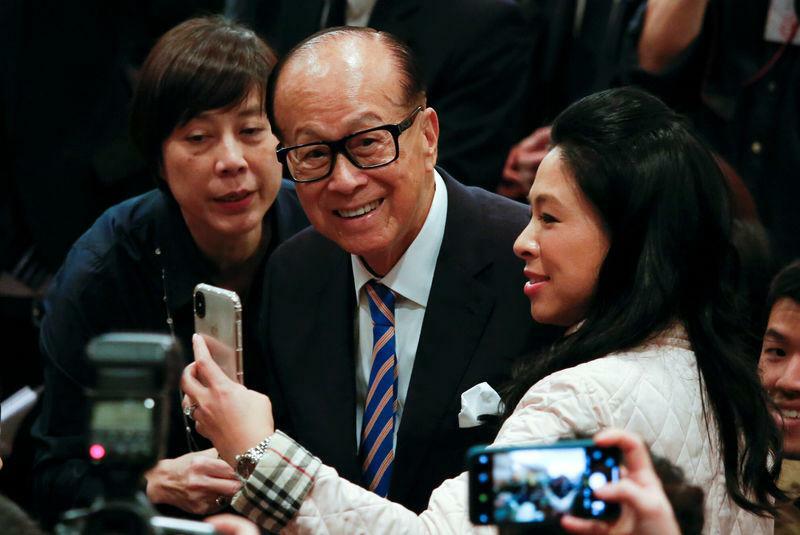 "Li Ka-shing's real genius, to me, is not necessarily in the assets he acquired, but his ability to sell them at the right time," said Jonathan Galligan, head of Asia gaming and conglomerates research at CLSA, the brokerage. "Look at anything he sold and, plus or minus a year, its hard to say he didn't pick the top – that's a tremendous skill." One of Li's best-known deals in this respect was the 1999 sale of its UK telecoms unit, Orange, to Germany's Mannesmann at the height of a market boom. After Vodafone bought Mannesmann soon after, the subsequent forced disposal of Orange to France Telecom produced a second windfall for the Li empire, which netted $21 billion in profits from the two deals. Today, the assets still held by Li through his flagship CK Hutchison Holdings Ltd <0001.HK>, include the biggest container port operator in the world, Canadian oil giant Husky, one of Europe's leading telecoms operators as well as a collection of UK businesses that saw him awarded a knighthood by the Queen in 2000. Even after stepping down, Li, who turns 90 in July, will remain a senior adviser for his sprawling business empire. Shrouded in myth and filled with apocryphal anecdotes and tales of family misfortune, Li's name has become synonymous with against-the-odds success by dint of hard work. He himself has regularly emphasized the hard work as well as his own drive to educate himself after becoming an apprentice in a watch strap factory at the age of 13, shortly before his father died. By 19, he had become general manager of the factory, overseeing up to 300 workers and office staff, and at 21, he founded Cheung Kong plastics - the foundation of his empire. That factory, with 1,000 square feet of space, operated around-the-clock, made a profit from its first year of operation and the young Li slept in a storage room in one of the many stories about his personal thrift. Li, whose wife died nearly three decades ago, will hand over the keys to his empire to his elder son Victor Li, who, unlike younger son Richard, keeps a low public profile. But despite the fables of Li's thrift and being an active philanthropist, many Hong Kongers resent the pervasive role his family plays in the local economy. They also blame the oligopolistic dominance of tycoons such as Li for social ills including a gaping wealth gap, extensive harbor reclamation, heritage demolition and extortionate property prices. It is true that it would be difficult to spend a day in Hong Kong without enriching the Li empire and Hong Kongers sometimes use a Cantonese pun on his name, which translates to "Li family city". Li's Hongkong Electric is one of two power utilities in the city, while Cheung Kong is one of Hong Kong's biggest residential developers. His companies also control one of the two dominant supermarket chains and one of the two largest pharmacies as well as one of Hong Kong's largest cellphone companies. Economists have joked privately that Li's businesses give him better first-hand knowledge of the health of the Hong Kong economy than any amount of government information ever could. Li is the most prominent of the city's powerful tycoons or oligarchs to step aside for the next generation, an exclusive peer group that also include Lee Shau-kee of Henderson Land, six months Li's senior. While these tycoons still control large swathes of Hong Kong, namely its core property sector, Chinese capital and businesses have become more intertwined with the city's economic fabric, challenging their dominance as the streets are increasingly lined with mainland-backed banks, petrol stations, shops and supermarkets. Over the past few years, Li's close ties with Beijing's Communist Party leadership have come under scrutiny. Li came under rare attack by some Chinese state media outlets a few years ago, who accused him of abandoning China by selling off some assets there. Li, however, has denied turning his back on China and says he is confident in the country and its president Xi Jinping. Though rarely accessible in recent years, the bespectacled tycoon enjoys shooting from the hip during public appearances and hasn't shied from making controversial and politically barbed comments. His lieutenants have however tended to be more circumspect - at least when it comes to commenting on Li. Asked in 2015 for his thoughts about what a surprise wholesale restructuring of the Li empire meant for the family's succession planning, Canning Fok, Li's second-in-command, told reporters, to laughter, that "We don't interpret what the big boss says." And asked this week by Reuters for his thoughts on any retirement by Li, Simon Murray, Fok's predecessor, kept it brief, replying via email simply "Happy Retirement!" Li, though, has fresh challenges in mind.